London, United Kingdom, Tuesday 6th November 2018 – Hermes Logistics Technologies (HLT) has welcomed GMR Group to their extensive client portfolio to implement Cargo Management Systems at Hyderabad International Airport (HYD), India. HLT has signed a five-year contract with GMR Group’s subsidiary GMR Hyderabad International Airport Ltd (GHIAL), including an upgrade schedule to ensure Hyderabad Airport’s cargo terminal will continue to operate with the most sophisticated Cargo Management Systems available. “GMR team’s requested timeline from contract signature to production was an extremely ambitious 60 days,” said Yuval Baruch, Chief Executive Officer (CEO), Hermes Logistics Technologies. “I am proud to say that HLT rose to the challenge and we managed to go live just 58 days after signing the contract. “It was a pleasure to work with GMR who are highly professional and committed their best people to work with us on this project, which was extremely helpful and enabled us to meet the implementation deadline. GMR today is one of the top five private airport operators globally, with a presence in India, South East Asia, and Europe. Hermes Logistics Technologies (HLT) is a provider of Cargo Management Systems to the air cargo industry. Its core application suite includes HERMES CMS (Cargo Management System), HERMES HMS (Hub Management System) and HBI (HERMES Business Intelligence). HERMES CMS manages all import, export, messaging, service monitoring and accounting processes for traditional cargo ground handling agents. HERMES HMS steers all inbound, outbound, messaging, SLA and accounting for airline hubs or transit shed operators. HBI is a comprehensive big data analytical tool, enabling informed management and operational decisions. Headquartered in the United Kingdom, HLT has been pioneering, developing and evolving cargo management systems for air cargo since 2002. All HLT applications are designed and driven by the HLT team of air cargo experts. Built with the specific requirements of air cargo handlers and airlines in mind, HLT products streamline cargo ground handling processes and maximise profits by using inbuilt best practice to reduce handling and operational errors. Visit Hermes Logistics Technologies Ltd. It was in 1978, when Mr. G.M Rao started off with a small jute mill, and established, over 28 years later, what is known today as the GMR Group. GMR is today a major player in the infrastructure sector, with world class projects in India and abroad. 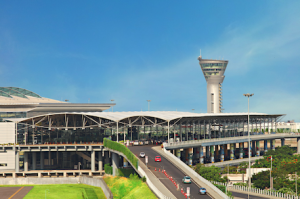 GMR Group is headquartered in New Delhi, and has been developing projects in high growth areas such as airports, energy, transportation, and urban infrastructure. With our vibrant portfolio of projects, GMR is uniquely placed to build state of the art projects in sectors that are of critical importance in the process of development. Using the Public Private Partnership model, the Group has successfully leveraged its core strengths to implement several iconic infrastructure projects in India.